Real estate professionals are all the same (or at least that’s the common perception). How can real estate professionals stand out by creating marketing so incredibly useful, people would pay for it? I wrote a book showing them how, and it launches November 4. The book is full of case studies, examples, tips and advice for real estate pros looking to massively change their business and stand out with help, not hype. Youtility for Real Estate is the second in the Youtility Professional Series, following Youtility for Accountants, which I released earlier this year. Both books (and the hard-cover Youtility) were published by Portfolio | Penguin books. 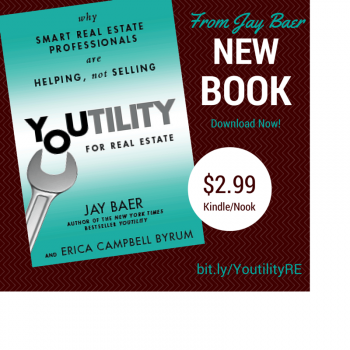 Youtility for Real Estate was co-authored by my genius friend Erica Campbell Byrum, head of digital marketing at Homes.com and ForRent.com. Youtility for Real Estate is available on pre-order right now for just $2.99 on Amazon Kindle or BN Nook (only digital copies for now). I really believe this is the best book in which I’ve been involved, even better than the full-length Youtility book. Do you know a real estate professional? Of course you do. Do them a favor and gift them a Kindle copy of Youtility for Real Estate. Even better, invite them to attend the free Webinar on October 29 that Erica and I are doing that will discuss the key themes in the book, and a ton of amazing case studies and examples. Free Webinar on October 29 talking Youtility for Real Estate. More than 2,000 RSVPs already! I would really love your support of this new Youtility book. If you know a real estate professional, spend less than $3 and send them a copy. And encourage them to attend the free Webinar. They’ll love you for it. And even if you’re not in the real estate biz (or know someone who is), there are lessons in this book that apply to us all. Thanks for your support. I’ll have another post next week sharing some of the amazing examples in the book. You won’t believe a couple of them, especially the ones from Australia!